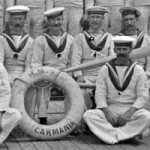 A photo of Lewis crew aboard HMS Carmania, which engaged and sank the German ship Cap Trafalgar off Brazil in 1914. The only Uig man known to have served on the Carmania was Donald Macritchie, 7 Aird. Last Sunday will be a memorable one in Lewis. During the night the Mercantile Marine authorities at Stornoway received instruction to mobilise the Royal Naval Reserve. On Sunday afternoon motor cars were dispatched to all parts of the island with notices summoning the men to report themselves at Stornoway.